The next CENVP Intake at year-end closes on 27th June 2008. As the application process is quite rigorous, we recommend reserving several weeks to fill out your application and get the required references and additional materials. Please contact registrar@cenvp.org with any questions regarding this intake. Intakes occur on a biannual basis in June and December. 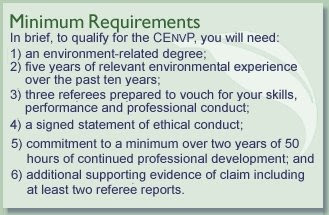 Subscribe to receive email news about the CEnvP Program, including information for upcoming intakes.